Rabbi Shmuel Auerbach, influential haredi rabbi and leader of the 'Jerusalem Faction,' passes away over Shabbat. Rabbi Shmuel Auerbach, 86, passed away on Shabbat (the Sabbath) due to a heart issue. He was the son of the late world-renowned Torah luminary and "Gadol Hador" Rav Shlomo Zalman Auerbach, and became the leader of the extremist Lithuanian-haredi (Litvish) "Jerusalem Faction" or "Peleg Yerushalmi." He served as the dean of the "Ma'alot Hatorah" yeshiva and was an influential rabbi in the haredi community, leading the fight against haredi enlistment in the army by opposing registration of haredi young men with the IDF. Israeli law mandates that every draft-age male register with the IDF. However, anyone who brings a letter attesting to his enrollment in a full-time yeshiva program receives an automatic deferment. Rabbi Auerbach did not feel well when Shabbat began on Friday evening, and when his condition worsened, medical professionals called to the scene attempted to resuscitate him. According to United Hatzalah, the EMS organization's dispatch and command center received an emergency call stating that Rabbi Auerbach had lost consciousness. Volunteer EMTs, paramedics and doctors from United Hatzalah, and a United Hatzalah ambulance team performed extensive CPR on Rabbi Auerbach in an attempt to save his life. Doctor Adam Ballin, a volunteer doctor and ambulance driver with United Hatzalah, said Saturday night, "We performed extended CPR on Rabbi Auerbach in an attempt to save his life. When the intensive care ambulance arrived, he was transported to Shaare Zedek hospital after his pulse had returned. After Shabbat was over, we were notified that Rabbi Auerbach had passed away in the hospital." When Shabbat ended on Saturday night, people gathered at the Ma'alot Hatorah yeshiva in Jerusalem's Shaarei Hesed neighborhood, where Rabbi Auerbach lived. 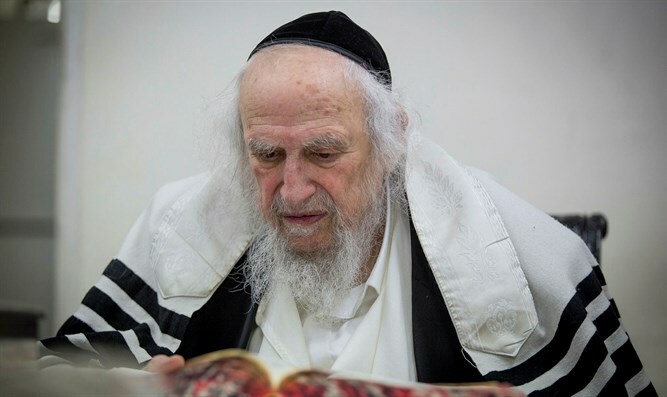 Rabbi Auerbach left the Degel Hatorah party a short time after Rabbi Yosef Shalom Elyashiv passed away and Rabbi Aharon Yehuda Leib Shteinman, who passed away in December 2017, became the leader of the Lithuanian-haredi (Litvish) public. Rabbi Auerbach then led the "Bnei Torah Movement" or the "Jerusalem Faction Group," known for exacerbating the haredi community's fight against drafting haredim into the IDF. Rabbi Auerbach believed that Rabbi Shteinman's policies on the haredi draft were too compromising, and saw himself as the continuation of the more extreme Litvish leader Rabbi Elazer Menachem Man Shach. To this end, he told his "hasidim" (followers) to go into the streets and actively protest drafting haredi men into the IDF. These protests were criticized by other haredim, who consider them to be a desecration of G-d's Name. As part of his efforts, Rabbi Auerbach founded the Hapeles magazine, in which he expressed his opinions. Over the years, many haredi advertisers refused to advertise in Hapeles, so that they would not be aiding a magazine which did not agree with the mainstream haredi public. He was also known for many acts of kindness, including helping raise orphans, some of whom spent time in his home. Rabbi Auerbach's funeral will leave the Ma'alot Hatorah yeshiva, located in Jerusalem's Sha'arei Hesed neighborhood, at 11:00a.m. on Sunday morning.